Are you losing your voice? Aurora Suite 2005 can help. 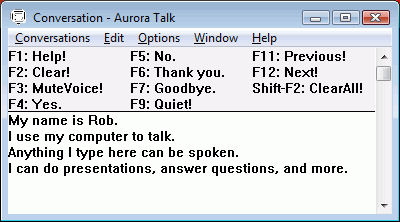 Aurora Suite 2005 helps people with speech difficulties easily talk to their friends, family and co-workers using synthesized speech on any Windows PC. Below is a brief summary of the features of Aurora Suite 2005 designed specifically for people with speech difficulties. To get detailed information and animated examples of Aurora Suite's many features, have a look at our Aurora Suite 2005 Tour. We also offer a Feature Comparison Chart for the three editions of our product. You can also Download Aurora Suite 2005 to try it for 30 days. - Professional Edition for comprehensive speech assistance and for users who need Aurora's full feature set and support options. - Standard Edition for basic speech assistance. Talk is the ultimate conversation tool. Just type what you want to say then press Enter to speak it. You can also assign frequently used phrases to function keys for instant spoken communication. It organizes, categorizes and lets you search what you have spoken before, and lets you say it again easily. You never have to retype a phrase. If you have a presentation that is already written out in a word processor and you paste it into Talk, it will automatically be broken up into individual sentences so you can easily control the pace of your presentation. If you get questions, you can use the function keys to give quick yes/no answers, or you can switch to a different conversation topic group for a longer answer without disrupting your presentation. When you are done, just hit a function key to return to your presentation. Aurora Suite's Speech macros work in whatever application you are using. Just program in the phrases you want Aurora Suite to be able to say, then type in short 2 or 3 letter codes to speak the message instantly. You can program as many phrases as you like, and the word prediction will display them onscreen to help you if you forget the codes you have entered. Aurora Suite includes speech synthesizers from Microsoft, and support for the excellent free L&H synthesizers and any other synthesizer supporting the industry standard Microsoft SAPI interface version 4 or 5. If you aren't satisfied with any of the included speech synthesizers, contact us and we can help you find one that will be to your liking. Tired of speech synthesizers pronouncing your name wrong? Aurora offers built-in pronunciation correction that works with any synthesizer, so you can be assured that the synthesizer will always pronounce words the way you want it to. Echo can read back instantly as you type in any application, or it can read text directly out of your applications such as word processors, email or web browsers. If you need help reading your email, documents or web pages, Aurora Suite can read them aloud for you. The Echo toolbar can read any text you mark with the mouse or keyboard, or it can read menus, dialogs and windows just by putting the mouse cursor over them. It can also read the contents of the clipboard as well as the word, sentence or paragraph you are typing. As you type, Echo can read back what you are typing. It can read everything from individual keystrokes, up to entire paragraphs with 10 different customization options. If it should happen that the person you are talking to has trouble understanding your synthesized speech, Aurora Suite offers the ability to have any text spoken by the speech synthesizer displayed onscreen and a highlight shown on the word currently being spoken. You can Download Aurora Suite 2005 to try it for 30 days, read the User's Guide or view the Online Tour.